One Saturday afternoon, I ventured to St. Lawrence Market and picked up a small bottle of Rosewater. I had no idea what I was going to use it in but it was something I wanted to play with. Apparently you don’t need much to add a delicate fragrant taste to your cupcake. This recipe comes from Cupcake Heaven by Susannah Blake. 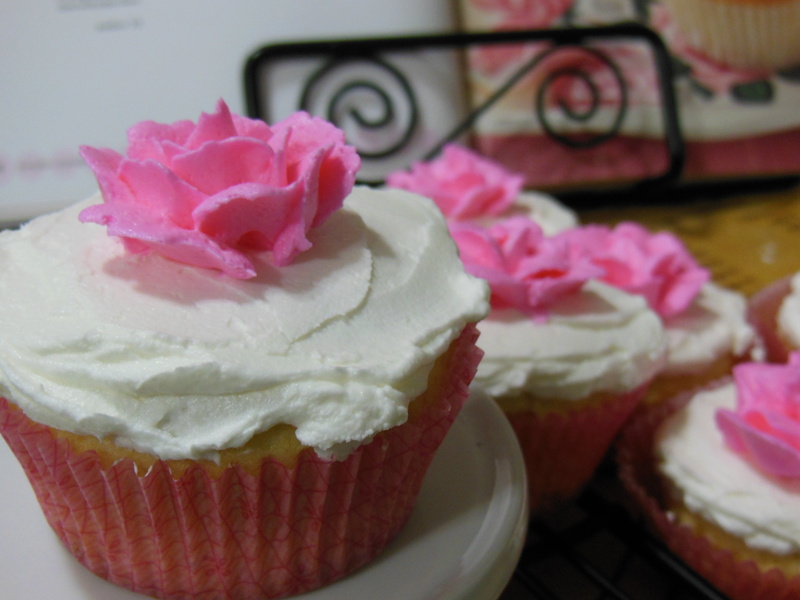 The book decorates the cupcakes with sugared rose petals and pink glaze. I went with my usual buttercream frosting and piped a rose on top. Beat the butter and sugar together in a bowl until pale and fluffy, then beat in the eggs, one at a time. Sift the flour into the mixture and fold in, then stir in the rosewater. Spoon the batter into the paper liners and bake in the preheated oven for 15 minutes until risen and golden and a skewer inserted in the center comes out clean. Transfer to wire rack to cool. Beat shortening and butter together. Add icing sugar and beat for about 3 minutes, scraping the sides. Add vanilla and milk and beat for another 7 minutes until fluffy, scraping the sides as needed.